Maurizio Sarri remains steadfast in his stance that N'Golo Kante cannot operate at the base of Chelsea's midfield in his system. Sarri has received some criticism for pushing Kante into a more advanced role in the Chelsea engine room, with Jorginho, who followed Sarri to Stamford Bridge from Napoli, playing in a deeper position. The Italian had harsh words for Kante after a 3-1 loss to Tottenham last month, claiming the France international is not technically good enough to play in Jorginho's position. 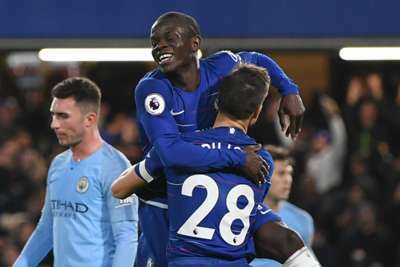 Kante responded by scoring in a 2-0 win over Manchester City in their last Premier League outing and, speaking ahead of Chelsea's game at Brighton and Hove Albion on Sunday, Sarri reiterated his belief that the former Leicester City man is best deployed further forward. "We have a squad for this kind of football," Sarri said. "If you buy Jorginho and have [Cesc] Fabregas, then I think you have to play 4-3-3. If you play 4-3-3 in my style of football, then the central midfielder is a very technical player. "Jorginho is very fast in the mind. He is able to play one touch or two touch. Fabregas also is technically really very good. "I think that Kante in my style of football has to play [further forward]. I can understand that somebody might think something different but if you think to my football, you have to say that I am right."